Once Again, we will join hundreds of Scouts from all over the Bay Area to pay tribute to those who served by planting American flags at the San Francisco National Cemetery. This is typically one of the most meaningful events of the year, reminding our Scouts the sacrifice many have made to make our country what it is today. Scouts and leaders must be in full Class A Uniforms. Friends and family are welcome. Again this year, we will join hundreds of Scouts from all over the Bay Area, and thousands across the country, to pay tribute to those who served. We will be planting American flags at the San Francisco National Cemetery. 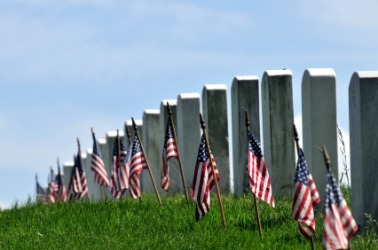 This is typically one of the most meaningful events of the year, given the importance of the holiday and direct involvement the scouts will have in honoring our nation's fallen heroes. The ceremony will begin promptly at 9:00am and we will likely be completed with the flag planting by 11:30am. Scouts, friends, and family welcome. Scouts and leaders must be in full Class A Uniforms. Again this year, we will join hundreds of Scouts from all over the Bay Area, and thousands across the country, to pay tribute to those who served. 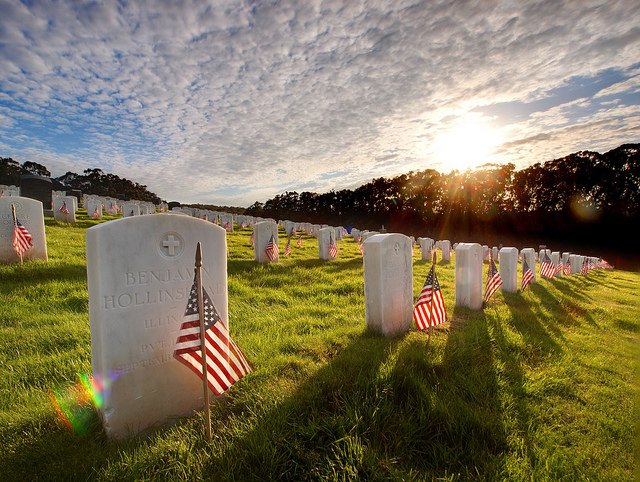 We will be planting American flags at the San Francisco National Cemetery. This is typically one of the most meaningful events of the year, given the importance of the holiday and direct involvement the scouts will have in honoring our nation's fallen heroes. The ceremony will begin promptly at 8:30am and we will likely be completed with the flag planting by 10:30am. Scouts, friends, and family welcome. Scouts will receive a patch. Please RSVP via evite to reserve your spot. A huge thank you to the loyal scouts who traveled all the way to the Presidio in San Francisco to honor our fallen soldiers and veterans on Memorial Day weekend. Each scout assisted with the “planting” of an American flag at the headstones of the military cemetery, joining other Cub Scout packs from all over the Bay Area. Each scout earned a special Memorial Day patch for their efforts. This is truly one of the most meaningful acts of community service our boys can perform. Update 2 (5/25 10pm): We have 32 people signed up so far. The coordinator told me that they only have 350 patches to hand out & they may have more scouts than that, so be sure to get there early. The program starts at 9am & he said it should only last "about 90 minutes". Keep in mind that the flyer says 9-12pm. Scouts & Adult leaders- make sure you wear your full Class A uniform. It gets you free admission to the Exploratorium. If any of you are still interested in going, it is not too late. Just let me know. Update 1 (5/25 3pm): We have over 10 non-uniformed adults signed up so far and have secured a group rate of $10 per adult and $7 per child in case you want to bring siblings along. More details to come. Stay tuned. 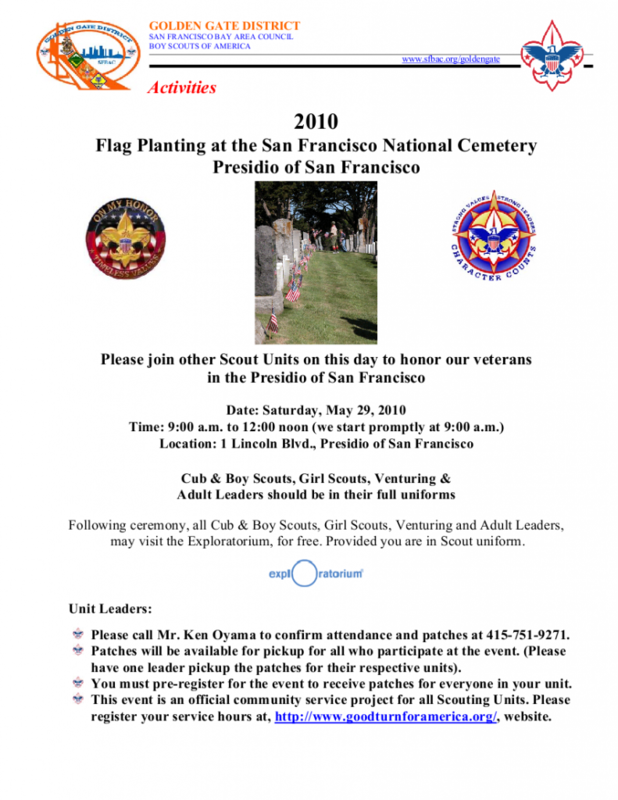 I know this is last minute but there is a Flag Planting Ceremony at the San Francisco National Cemetery this Saturday. It comes with patches and free admission to the Exploratorium. We need a quick head count by TODAY to reserve patches. - I need number of scouts attending & number of Adults. - If we have enough people, we get discounts on the non uniformed adults & siblings. P.S. Only scouts and adult leaders in full uniform will be admitted to Exploratorium for free. Parents will have to pay the general admission of $15 per person. If we have 10 or more non-uniformed parents, we should be able to get a group rate of $10 per person.